I was ready. But sometimes…it’s a bad day. And mine was. I actually took all the changes and modifications before the race in stride. I was ready to race. It didn’t faze me. At first I was worried about all the turns on the modified bike course but I accepted them (and practiced before hand too!). It was all good. I was feeling confident. Modifying the swim? Ok. The WTC employees were earning every bit of their salary to make the best event they could make happen happen despite extenuating circumstances. The athletes may not have agreed with all choices and decisions but….honestly I do not doubt they tried as hard as they could. I felt flat a few days out from the race but I didn’t let it get to me. It’s taper, you feel bad. I have had an amazing time training for this event. I felt amazing. I’ve trained with amazing people and have had the most support ever. I felt loved and confident. Calm. Carmen, Sami and I randomly ended up not only in the same hotel, but rooms next to each other. So Carmen gave me a ride to the race start along with Sami. Carlos could sleep in and stay with my parents. Life was made a lot simpler. I could also borrow Sami’s pump (that was a big step for me…leaving my pump behind! Talk about a security blanket. And guess what? It was fine! Worked perfectly). As I headed in to the water I saw John Dapper waiting to go in towards the back. The one thing on my mind the entire swim? I should have run over and hugged him before heading on. So John….I was thinking of you almost the entire race, wishing I had given my teammate a hug. The entire race! Not continually, but it would pop in. Now…the race! The swim felt long. I felt OK. Never had any anxiety or shortness of breath that I usually get. Maybe that should have been my first clue I was going too easy. But as I progressed I started to think maybe I am kicking too hard. And I knew that was about right. And kept going. 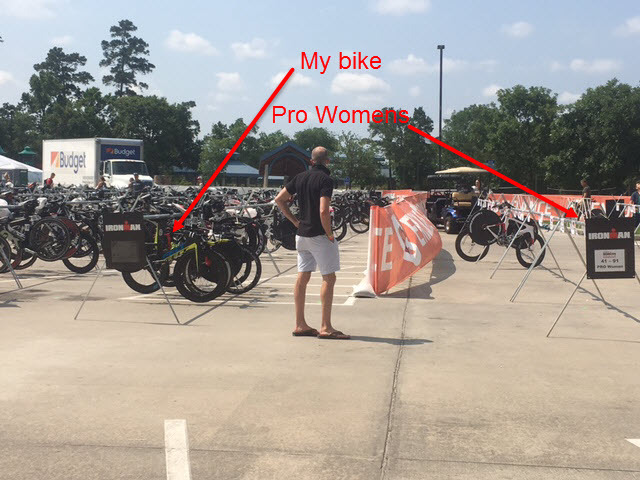 I had a lot of negative thoughts the first half the swim….what am I doing? Etc. but…that’s kinda typical for me. Once I find my rhythm I am good. And I found it. The swim was mostly clear. And I don’t think I strayed too far from the path. In fact, on the way out it served to my benefit. It really was a calm swim. I didn’t get hit too often, and was passing people from what I could tell. It did feel long. And I was happy to finally hit that third turn buoy and spot the sit arch. Soon I was grabbing a volunteers hard and running. As I neared bags I called my number and headed to where I knew it was. A volunteer handed me my bag and I headed to the changing tent. It was mostly empty and a volunteer halved me. I need to get faster as I had to think about what she asked me. This must become automatic. Shoes, helmet, not much else and I was off. Really, T1 time was too long for what I do. I had a long run to my bike, but that was good as the run with my bike was short. My rack spot was fantastic: first row behind the pro women. Really, I couldn’t have asked for a better spot. As I grabbed my bike I saw Karen and Paige and smiled as I headed to the mount line. They cheers me out on to the bike. As I headed out I saw the Dynamo cheer squad. I surprised them with the new Podium kits: black and pink vs our traditional colors of pink and gray. It was my bike that was recognized, and not me. But I left to a round of cheers. I had wanted to get on the bike through most of the swim. And was happy to be in my spot….on my bike. At first my legs were off which I take as a good sign…it’s normal. I did spin ups to losses my legs and get ready to ride. And I did. But my legs never really arrived. And after two hours I watched my power go down. Despite my efforts. I was riding less than at FL 70.3 and couldn’t get it back. My heart rate was ok…which is also odd for me. I was expecting it to be lower. Never fear…it eventually dropped too, after 3.5 hours out there. The course itself was…a drunken nightmare. We kidded around that the course developers started drinking at noon and the started making up the course after 8:30 pm, and many drinks. I know they did the best they could, and actually, I had a good rhythm and did well even with the turns and loops and back and forths. It seemed crazy, but not hard. I didn’t focus on the path, but rather my execution. I had a lot of mantras and thoughts going through my head…trying to keep myself positive despite my low power. I know this course will never be used again unless extreme circumstances again, but I had some observations as I rode. Wind was a factor for about 2/3 of the course. Also, I saw several people with flats due to road conditions. Over inflating your tires worked against you in a big way on this course. One person, at about mile 92, had a blow out right in front of me. At first he didn’t stop….I guess thinking he’d just ride it in. But soon his tube was off the rim and he was on his rim. That’s not good. I went as far left as I could to avoid him if he lost control, especially as his tire and tube started spinning off. For the most part we were separated from traffic by cones. One long section about mile 80 the out cones to the left of the road dividing line and we shared a wider lane than normal with cars, and concrete blocks on out right. There were volunteers all over the course. Many with stop/slow signs. Carlos spoke with one such volunteer and she wasn’t sure what she was supposed to do, she was just told to be there. They had to recruit tons of volunteers for the bike course. Tons. They were all over and whether they know exactly what they were doing or not, they helped. Drivers were aware. Police were everywhere and traffic, for me, was never an issue. And traffic was horrible in places. I saw emergency vehicles at an accident probably caused by a driver distracted by the race, and as I passed through another, two people were sitting on the cab of their truck knowing they weren’t going anywhere soon. I am sure many people did not appreciate the bike route. I watched my nutrition and was spot on. I refilled/topped off my aero bottle with water at almost every water station…using what was left after dousing my head and shoulders with delightfully cold water. I did spit up my nutrition a couple of times, and even tried to make myself throw up once, but all in all, I felt good. I did feel like I needed more and added in my Kona Mocha EFS gel earlier than planned, and that helped. I think I need to revisit calories and nutrition as every race I hit a point where I know I just need more. I saw Carlos and my parents twice…once in the first 1/3 of the race and once near T2. The dismount line came up fast and I didn’t have a chance for a flying dismount, so I ran transition in my bike shoes. It was long! I headed to where I knew my bag was and a volunteer handed it to me, and I was off to the tent. Again…I had too much thought in transition, the fastest part was the volunteer who fills my water bottle, which already had my Infinit powder in it. Cold water!! Thank you Erin for that fantastic idea!! it worked perfectly. It also said me having to go to t2 in the morning and saved tons of walking and worry. I headed out on the run, hit up the sunscreen station and was off. It took the first loop for me to be ok with knowing I would “run” the race. Slow. I felt flat. Legs weren’t there. Running an Ironman isn’t easy. I’ve never felt fresh as a daisy, but I’ve had good runs. And this was…not. It was one of my hardest runs, if not the hardest. My legs were just…still in Atlanta? My heart rate was in the middle of where it should have been. I walked stations for ice, water, cake, and/or pretzels. It was slow. I wanted to cry and apologize to every single person who was cheering me and believed in me; I felt so bad in disappointing all of them. I didn’t, but that’s how I felt. Instead I thought of every positive mental image I could to keep going. EVERY one. And luckily, there were many. By the second lap I got my brain on reset and was feeling better mentally. I still wanted to cry and say I’m sorry (I didn’t), but knew I’d keep moving. It wasn’t what I knew I could do. It wasn’t what I wanted to do. But I wasn’t moving faster. Maybe I didn’t need to walk each aid station.., that would have helped. In retrospect…I should have tried to move through the aid stations faster. Slow but steady my miles clicked by. By the third loop I was not even done with 1 bottle of my nutrition. I had been opting for water, pretzels and coke. For some reason by the run of an IM, Infinit doesn’t want to go down. It gets harder to make it go down with each IM it seems. It’s great for the bike still, and no GI issues. On the third loop I was determined: slow but steady. Clouds appeared, lightening. And rain. Hard rain. And just short of mile 21 I (along with all other athletes around me at various parts in their run, some on their first or second lap, others like me on their third) was stopped due to weather. And we waited. I had the little excerpt from Bugs Bunny’s “What’s Opera Doc” when Elmer Fudd brings the winds, earthquakes, typhoon, and SMOG! We weren’t at a timing mat like had been announced. A group of 4 broke away. I think volunteers took their numbers. I made my way to the front. We were near an aid station. They brought out garbage bags to keep people warm, and food and drinks from the aid station. Potato chips never tasted so good. I ate a bit to keep energy up. I chatted with people near me. We tried to keep a sense of humor. What else can you do? Betty came up and walked passed me, and I went behind her. As we waited for clearance to begin again we started moving forward slowly. By the time we stared we had moved up about 50 yards or so and were at the 21 mile sign pretty much. I still hadn’t peed all race despite all the water I drank, and was hoping I could make it without my bowels letting loose either. I had a side stitch that had developed about mile 20., and was still there. After all the rain and lightning were passed, we finally got clearance to start. And it was like a 10k mass start, but with stiff legs, despite my best efforts to keep them moving and shaking them out. Now it was determination to finish. I only walked 1 of the 3 remaining aid stations, keeping my steady pace. I felt the side stitch but it wasn’t bad. I finally took the turn for the finish line and kept moving, not caring about sharing the finish line…just finishing. Vallee and Carmen yelled. Vallee was losing her voice. I was grateful. I saw Carlos, my parents, Karen and Paige, and kept going. And I finished. 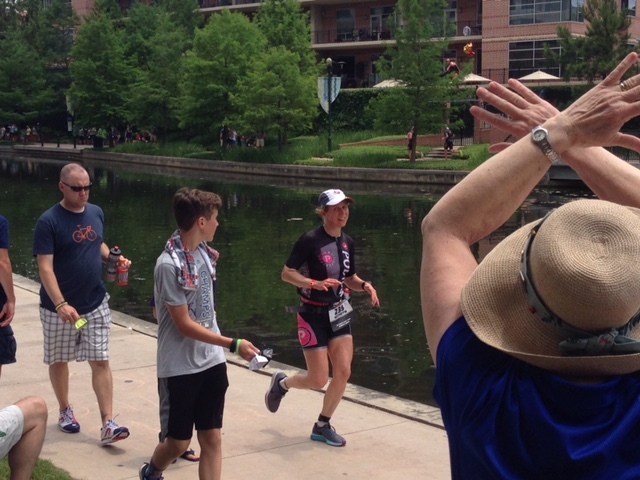 Mike Riley was at Texas, and I think it was him who got in my face as I crossed the finish line. He did that “you are an Ironman squat” and cheer in front of me and I just gave him a blank look of “who are you and why are you in front of me”. Oops. That was probably my only chance to celebrate a finish line crossing with Mike Riley (he’s kinda busy) but…yeah. I wasn’t thinking too much. I walked on, escorted by a volunteer. Got water, skipped the picture line, and spotted Erin and some of the Dynamo cheer squad just past the finish line. They had been pretty awesome all day long and I was grateful for them, even when I was shaking my head and in a bad place mentally. 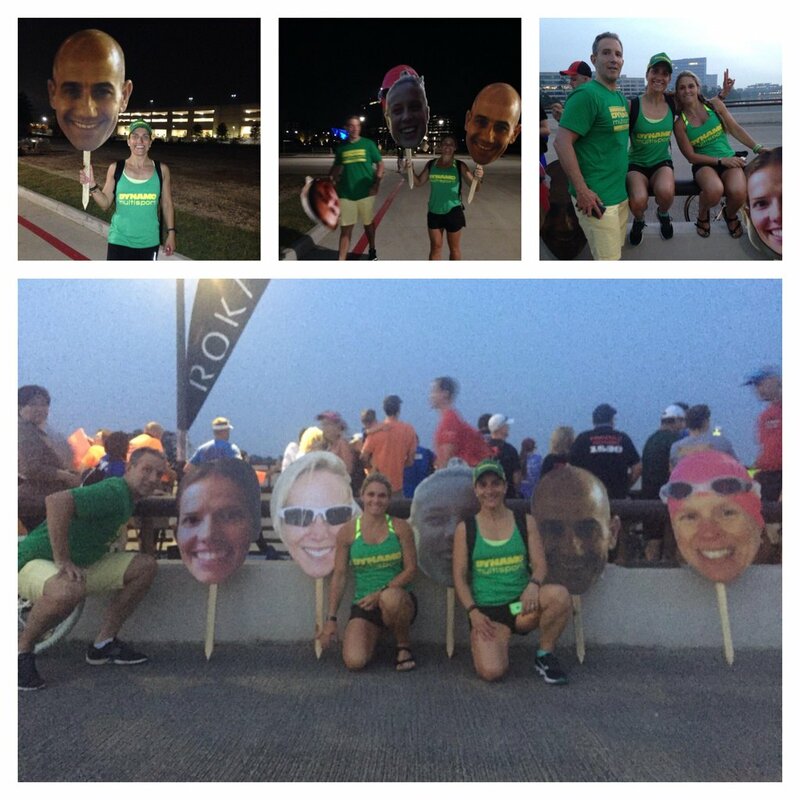 I mean…they put giant heads of all of us on the run course! Seriously. This will reek of “woe is me” but FYI – I’ve moved on. I will not stew. Too many goals. And really, it’s pretty obvious this race was more than the race. it was an incredible journey. Which is more than many can ask for. Overall, it wasn’t the race I know I can do. I missed many goals and objectives. I was aiming for a better time and position. But, it was not my best day. I used my positive arsenal to keep me moving forward. I could ruminate and stew, but I am taking lessons and using them moving forward. I am already looking forward to my next IM – Louisville.